Grey and brown are two colors that are tricky to combine but today, everything I'm wearing is because of the frigid weather we had today. I'm wearing my thickest hat, thickest sweater and one of my warmest scarves to keep warm. 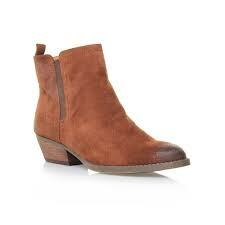 And the boots are new from Nine West. I finally found stylish flat ankle boots that I can wear all day with boot cut pant styles. You look very cozy and the hat really looks great on you! Love that color combination! You look great.